Conference Rooms: What are they good for anyway? One acoustician’s perspective. The conference room – vital, ubiquitous and often in short supply – is the place for people to meet and collaborate. There’s almost never enough conference space, especially in this era of open-plan office layouts and huddle rooms (that’s another acoustics article). So what makes a good conference room? Why is one always booked over all the others? The answer is acoustics. The ideal conference room is one that’s designed to serve the primary purpose of providing a space where people can come together (both physically and virtually) to communicate ideas and be heard, clearly. The appropriate acoustic environment enables clear and intelligible speech communication within the room, as well as between rooms linked by technology. Part of a good acoustic design is having a minimum quantity of sound absorption. However, I often walk into cavernous, reverberant echo chambers that do not provide a satisfactory acoustic environment for today’s technology-rich world. These days, conference rooms are often stripped bare of essential “soft goods” featuring hard concrete floors, exposed concrete or metal deck ceiling, bare gypsum board walls and full height glass. There are certainly a number of reasons for this design approach (including daylighting, aesthetics, client budgets, among others), but that should not excuse us from incorporating the necessary “acoustical infrastructure” to allow these rooms to function properly, especially given the amount of money spent on technology to link these rooms to the outside world. There’s always a middle ground. What’s really going on inside a typical cavernous conference room? You are having a conversation with a colleague/client in your conference room, as well as one or several others connected remotely via a telephone line, Web conference link or videoconference. The direct sound energy from your voice reaches the speakerphone/microphone, and then some short time afterwards, the reverberant sound energy from your voice (after it has been bouncing off of all the hard surfaces within the room) also reaches the speakerphone/microphone. This combination of direct and delayed reverberant sound energy is simply pushed down the line to the audience on the receiving end of the call. What do they hear? They hear the combined direct and reverberant speech coming out of the speaker phone/microphone at one time as one fine cocktail of gibberish. The poor souls on the receiving end of the call struggle to process the sound, which can be beyond the processing capabilities of the human brain. “I’m sorry. We’re having trouble hearing you. Can you talk louder into the phone, PLEASE?! ?” leads to miscommunication, wasted time, fatigue, stress, and especially long meetings. Speech intelligibility matters. Participants in the room have a less difficult task with speech intelligibility because of the magic of binaural hearing. When present in the room, our two ears and brain have the wonderful ability to process/separate the direct sound energy from the reverberant sound energy through sound localization, which makes in-room speech communication possible in all but the most poorly designed conference rooms. (Even in-room speech communication becomes more and more difficult in hard-finish conference rooms as their size increases.) However, the poor folks on the other end of the call (which is increasingly the majority of the participants) have no such luck. They are left with a frustrating mess of partially intelligible sound coming at them. Absorptive finishes can help. All of the above problems can be easily avoided. We can make life for in-room and remote participants much more comfortable by simply addressing the acoustic environment in the conference room. The role of sound absorptive finishes inside a room is to reduce the reverberant sound energy to such a point that the direct sound energy becomes the primary path of communication inside the room and on the receiving end of the call. The end result yields intelligible speech communication between all participants. While it does take some planning, thought and knowledge, it doesn’t take a lot of material or money to allow conference rooms to perform well acoustically. Every conference room has a unique personality, as it should to meet the client’s needs, but all conference rooms should incorporate a sufficient quantity of sound absorption. Good room acoustic design is an integral part of the conference room design, especially in today’s hyper-connected world. 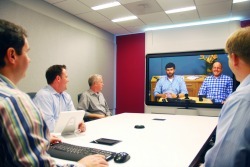 Without it, onsite and remote conference room participants will continue to struggle with the primary function of a conference room – intelligible speech communication. Next up: What do glass walls mean for speech privacy? Michael SantaMaria is a senior acoustics consultant with Waveguide and is keen on improving communications in business and education by designing sensible acoustic environments, one conference room at a time.